Xi’an, famed for its Terracotta Warriors of ancient times and as a strategic interior location in Maoist China, is rising again, as a provider of producer services. 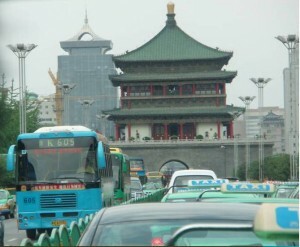 Xi’an’s importance as the major city in central western China extends from its history as the imperial capital of China, anchoring the eastern terminus of the Silk Road, to its current status as the capital of Shaanxi Province and a major destination for both tourism and high technology development. The famous Terracotta Warriors–Great Wall architect and Emperor Qin Shi Huangdi’s lifelike funerary soldiers and horses– as well as the nearby Banpo excavations of some of China’s earliest archaeological finds, attest to the site’s strategic location at a fertile bend of the Yellow River. Beyond its agricultural riches, as the ancient imperial capital Xi’an functioned as a wealthy Silk Road entrepot for trade with lands from India to Rome. The impressive mosque constructed to honor Moslem mariner Admiral Cheng Ho in his hometown still attracts worshippers, another lingering sign of Xi’an’s role as a doorway from Han China to the Western lands. Following the Communist victory in 1949, elements in the PRC’s leadership became concerned over the perceived vulnerability of mainland China’s east coast cities to an invasion. 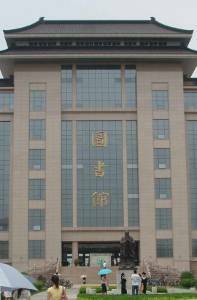 A series of interior secondary cities were chosen as a “Third Line” for the relocation of technical research universities and strategic industries. These later formed the basis for Xi’an’s rise to new regional prominence around the turn of the 21st century. 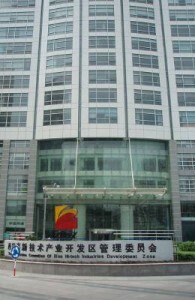 The three main components of modern Xi’an’s producer services sector are financial services (banking, insurance and securities), information consulting (advertising, lawand accounting), and computer services (software, data processing and database services). In the decade from 1997-2006, employment in Xi’an’s financial services firms increased from 30,000 to 43,000 employees; information consulting employment almost doubled from a 60,000 base; and computer consulting doubled from 16,000 to 32,000. Clearly, Xi’an’s service-based economy, also referred to as the tertiary sector, was experiencing lift-off. Key universities with promise for research breakthroughs in commercial areas were chosen as investment targets. These institutions were then provided with extra funds, enlarged, and in many cases moved to new campuses. The new locations were often developed in tandem with nearby high-tech parks to house hoped-for spillover businesses based on breakthrough products. Xi’an Jiaotong University’s high-tech park pioneered this concept in western China, which Chengdu’s Sichuan University used in turn as its model. Examples of such development include special facilities for students returning from at least one year of education abroad, with ideas for promising practical research projects, and business incubators for fledgling entrepreneurs. A traditional model of economic development consists of five stages: primary level extractive activities such as agriculture, fishing, or mining; secondary-level manufacturing activities; a tertiary level of services provision; a quaternary level of occupations involving knowledge creation; and quinary-level command and control functions. A maturing, increasingly developed economy shifts its economic function concentration up the ladder of these stages, though progress is not perfectly linear. China’s predominance at the secondary stage does not mean that it is less advanced than India, whose economic modernization focuses on tertiary-sector service occupations. China has sought to fund economic modernization based on promoting innovative industries through a number of schemes such as the Spark Plan, the 863 Plan, the Torch Plan, and several other technology-targeted programs. China’s service sector is based more on domestic innovations and firms than India’s, which is linked more with global foreign companies. For China this promises more return on investment through less leakage outside the immediate area. Following proclamation of the “Develop the West” policy, Xi’an became a major target for accelerated attention along with Chengdu and Chongqing. From 1997 to 2006, the industrial output value of Xi’an’s service industry increased at an annual average rate of 13.74%, compared to traditional service industries of 0.74%, and represented a growth from US$8.113 billion to US$25.85 billion. MapProducer Services form a prominent sector within the services category. Increasing in importance since the 1960s, producer services emerged as an important function of Xi’an’s economy starting inthe 1980s. Firms in this sector serve manufacturing, business and government needs rather than sell directly to individual consumers. Their location is not tied to the traditional downtown central district, but needs to be close to their business customers and in the vicinity of high-speed Internet lines due to their information-intensive nature. Firms engaged in producer services are often housed in office towers, since the expense of telecommunications infrastructure makes this a congenially concentrated footprint. The growth of producer services accompanied the external substitution of service functions formerly performed in-house. Reasons for externalization include cost as well as expertise; the increasingly complex nature of business requires complex services, from financial to computer consultants. This condition has been found to be particularly positive for promoting localized growth within highly populated metropolitan regions anchored by advanced cities. 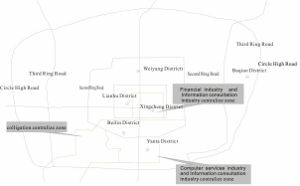 The location pattern of Xi’an’s producer services subsectors varied by proximity to their target market. Financial services cater largely to decision makers engaged in the processing of information for the traditional FIRE (finance, insurance, real estate) companies that occupy a concentrated nucleus in the central business district. Information consultancy services concentrate close to their clients in the southside university and research park region, as well as in the central business district. Due to the particular need for fast communication, computer services are the most agglomerated along the southern research periphery of knowledge-intensive industries. To illustrate its development stature, Xi’an also acquired a new pedestrian mall, though less bustling than Beijing’s Wangfujing or Shanghai’s Nanjing Road complex ” but still a statement of retail strength for a west China inland city in a largely poor province. As in Chengdu, another major western city with a new pedestrian mall area, nightlife can be more vibrant than during the day when many workers are occupied. Government policy–pouring funds into key western China locations in order to stimulate the development of future wealth in the services sector–seems to have been successful in Xi’an. This metropolis managed to retain important parts of its visible history in the form of pavilion towers and a uniquely intact wall around its old urban center. Outside the surrounding moat, new Xi’an features glass office towers largely occupied by the new services sector. Among the most important of these are the featured producer services, mirroring and sustaining the strength of its economically pioneering and relatively advanced client firms. 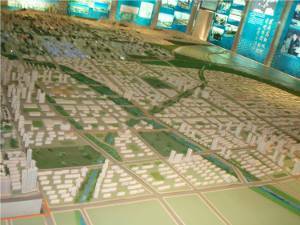 The orderly and rational nature of the agglomerated producer service and client companies along Xi’an’s southern boundary indicates the power of state-level urban planners to complement economic construction with physical infrastructure, creating a reinvigorated oasis of affluence in the dry lands of west China. Susan Walcott is Professor of Geography at the Unviersity of North Caroline, Greensboro. Chen Ying is Professor of Geography at Shaanxi Normal University in Xi'an, specializing in urban geography.